Drone ribbons have been around for centuries; the origins have been lost in antiquity and may be as old as the addition of a second drone to bagpipes. These strips of fabric add a decorative flair to your drones. They can be as simple as black for a funeral or a tartan matching your bag cover or as elaborate as flag colors for a national holiday or as wild as tiger stripes. There can be a price for this decorative touch to your pipes. Drone ribbons have been known to act as a sail in a strong enough wind and blow the drones forward right off a piper's shoulder. The ends of light-weight drone ribbons have also been known to flap up over a drone top and knock out a drone, though even heavy wool ribbons are susceptible to this in heavy winds. A ribbon simply passing over a drone can make it sound unsteady—I know of one piper who experienced this while piping next to a heater vent in a church! Due to the host of potential problems, drone ribbons are not recommended for competition. 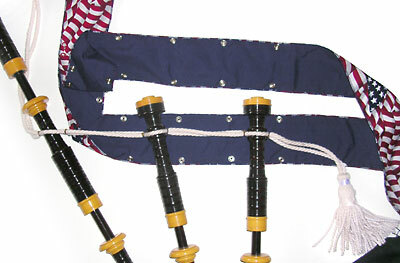 Drone ribbons also add to the weight of a set of pipes, particularly if they are 16 ounce wool. 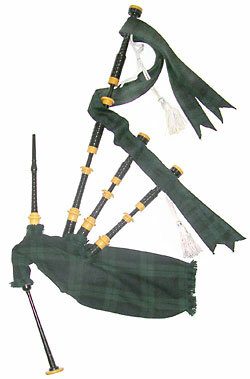 Most pipers only use drone ribbons for very special occasions: wedding, funeral or playing for some official event. Bands will often only use ribbons with full military style dress, such as a "Number 1" uniform—spats, horsehair sporran, feather bonnet, etc. Unfortunately, sometimes poor pipers use any distraction they can get to remove attention from their playing, that can include drone ribbons. Drone ribbons should never be used wrinkled. Rather than enhancing the performance, much like a wrinkled shirt, it may end up being an unwanted focus. It's best to avoid storing the ribbons with your pipes in your pipe case any longer than you have to. If you can manage store the ribbons flat separately and install them at the venue, that's best. Wool will be less likely to wrinkle than silk which wrinkles badly. Ribbons are best stored loosely rolled or gently folded with nothing on top of them. How to secure drone ribbons. Drone ribbons come in pairs. One passes in front of the drones, the other behind, and are positioned right over the drone cords holding the drones in place. Some commercial drone ribbons come with Velcro or snaps pre-installed. Some come plain, with the intention of the piper using whatever method and positioning that he or she prefers. Methods of securing drone ribbons are almost as varied as pipers. The most common modern methods are Velcro or snaps, but you may also see them tied in place with sewn heavy string (or thin ribbon), held with safety pins, staples, and other means. Safety pins are easily adjustable but may come undone with handling (or heavy wind!) and can often be easily noticed. Staples are also easily adjustable, have the same drawbacks as safety pins but also will typically damage the fabric with each insertion and removal. Some pipers use a mini-size staple which helps the eye-sore issue, but not the damage issue. Velcro is hidden between the ribbons. Once sewn in place it is not easily adjustable although the strips do not have to align perfectly to hold. The only real downside to Velcro is the hook side may catch and fray delicate silk drone ribbons. Snaps or string ties may be a better consideration. Snaps are not adjustable and once installed are considered permanent. (If you do manage to remove them, they leave weakened fabric behind.) Snaps must be aligned perfectly to hold. Snaps are visible on each side of the ribbons and can be distracting. Snaps are available in different colors so it may be possible to camouflage their use. Ribbon or string ties are sewn in place so are not easily adjustable, however, they are less work than Velcro to remove and sew again. These you will want near the top edge for two reasons. One, to allow the ribbons to hang down with gravity and second, to allow access to tie them. If they are placed in the middle, the thin drone ribbons will flop over and droop, and stiffer drone ribbons will make it a little more difficult to tie them in place. Hair bands are a much less orthodox method of securing. These fabric covered elastic rings—about 1" (2.5cm) in diameter—once sewn between both ribbons, slip over the drones and into place. You can either use three (one for each drone top) or four, the fourth positioned for the bass drone bottom section—which requires removing the top sections of the bass drone so it can be slipped over the bottom section. These, like string ties, should be sewn somewhat near the top edge of the ribbons. 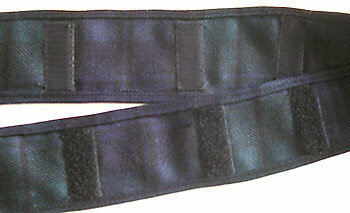 Here you can see the hemming and Velcro strips on the insides of this pair of drone ribbons. This set of drone ribbons uses snaps for securing. If you look closely at the upper left you can see that the exterior ring part of the snaps are red and mesh nicely with the red in the flag pattern. To help you in making your own ribbons or in placing your securing method, you can download my Drone Ribbon Sewing Guide (PDF, 54K). If you are looking for a sewing pattern, it'll serve. Making your own drone ribbons. Drone ribbons will cost as little as $30 for a quickly made set out of inexpensive material or as much as $80 for a high-quality set out of heavier tartan wool. Depending on your budget, patience, access to fabric and equipment, you may be better off simply purchasing a set of drone ribbons. But if you can't find what you want, are on a tight budget, or simply have time to kill, you can make your own. Choosing material for drone ribbons. Be careful with solid colors if you are trying to match colors in your kilt, particularly with reds. It's better to go too dark than too light, because any color difference will be less noticeable, but also because it won't show dirt as easily. One approach to using solid fabric is to use one color for the front side and a contrasting color for the back (often dominant colors from the kilt). It's not see all that often, but the effect can be quite striking. Drone ribbons are typically cut from what's called "tie-weight" tartan, that is, material with an appropriate thickness to make—you guessed it—ties! Enough of this material, about half a yard, can run $30 or more. This material usually comes in a maximum width of 54" (1.4m) which is about 20" (51cm) short of the desired length of drone cords. This means that you will have to extend the fabric, just make sure to correctly match the pattern when doing so. The tie-weight tartan also has a smaller tartan pattern which works nicely with the narrower applications such as ties . . . and drone cords! Sometimes clan associations already have 2" (5cm) wide tartan ribbon already pre-hemmed. 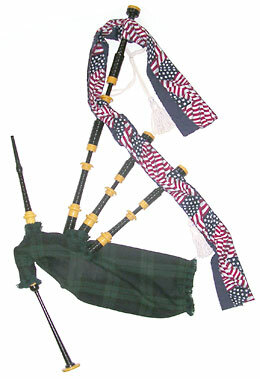 Some pipers prefer a bit wider, but is an acceptable solution. The poor man's method is to go to a local fabric shop and purchase a roll of tartan ribbon. If they don't have what you are looking for, it's something you can find online, such as by doing a Google search for "Tartan Ribbon ". Cutting and sewing drone ribbons. Completed drone ribbons are usually between 2" (5cm) to 3" (7.5cm) wide. While you might think it'll look impressive, don't make the drone ribbons much wider or you run the risk of them interfering with tuning—you need a secure handhold on the drone! You will want to hem the material down each side of the length. You will fold about 1/4" (6mm), then fold the same amount again, hiding the original edge, then it will be sewn. A completed hem is often about 1/4" (6mm). This means before you cut the material, you'll want to add 1/2" (12mm) on each long side to allow for the hemming. When cutting tartan material, you want the pattern ("sett") symmetrical down the length of the ribbon. Traditionally, the ends are cut to into a mild "V" shape to create to "tails." This "V" is usually not hemmed and allowed to fray a little bit for decorative effect. Some pipers opt to simply have blunt ends to their drone ribbons. And there you have it! Look out for heavy wind! Page first created in March 3, 2008.